Great idea and execution for the leaves trailing the car! I am so glad someone is going to do tortoise vs hare. I am glad they are wearing helmets because I wouldn't want them to get hurt. The rules are really up to the person doing the challenge for a particular month. I plan to take full advantage of my temporary dictatorship. Insert menacing laugh. 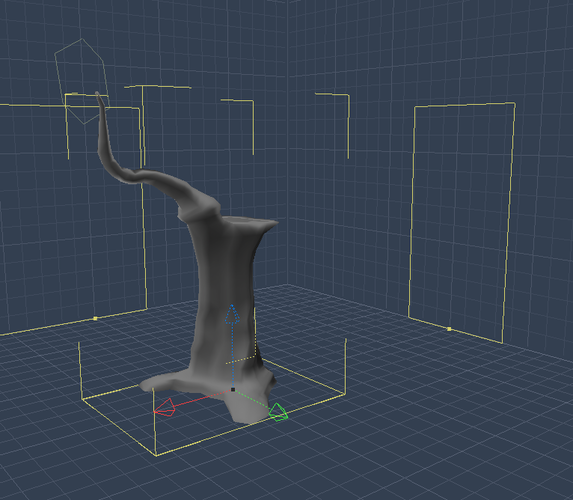 I'm building a custom tree for my scene. I have the roots, trunk and one branch started. I'll set up a surface replicator to generate the smaller branches and leaves. I'll define the location by either painting a distribution map, or if that's not accurate enough, I'll define a shading domain for that purpose. 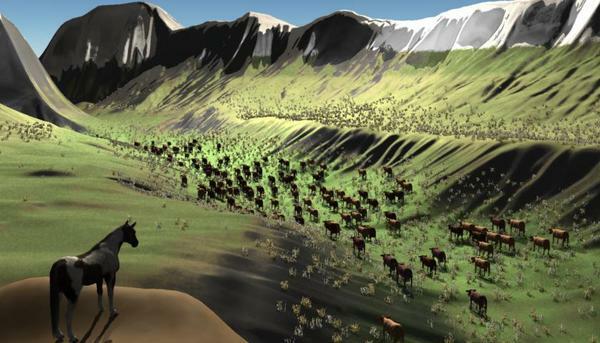 And here is the valley with a herd of Noggin's cows. I could use my rhino cow again, especially because the herd is in the distance, but I am getting tired of it. I changed the shader of the Noggins cow to a tan gradient. I used an environment channel to replicate a tree from Dart's environment pack (great job, Dart) along the higher slopes of the mountains. The tree distribution shader is too strict but I can fix that. Now I have the rough concepts of my two entries. 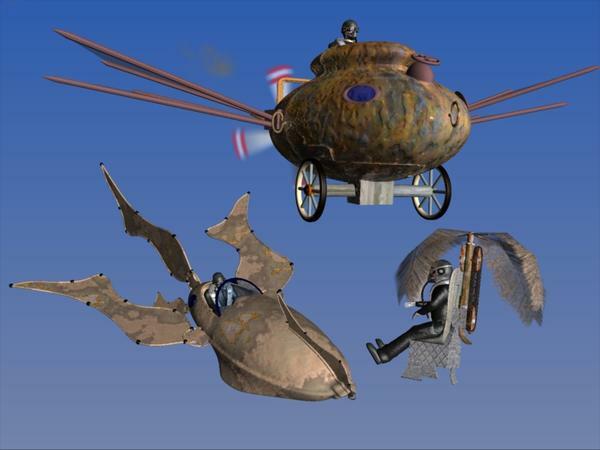 I will spend the rest of the challenge period trying to improve this image and the Mad, Mad, Mad, Mad World tribute. Otherwise, I will check in to rule on the occasional rule interpretation and to offer encouragement. Thanks, I can't find my image, but I did something similar in the past with clouds. I had this funky shape that I wanted in the shape of clouds and used the surface replicator and my cloud was the item replicated. Some great WiPs being done.. good to see so many different views on the challenges. I had a thoughty this morning for the 2nd Challenge ( don't fence me in ) and so I dropped the first one for now to make the second one..
as it was so simple and quick I had to do it while it was fresh in my mind. and came up with this.. I Like to Moo--ve It! I'm playing with the lights, but too many lens effects. 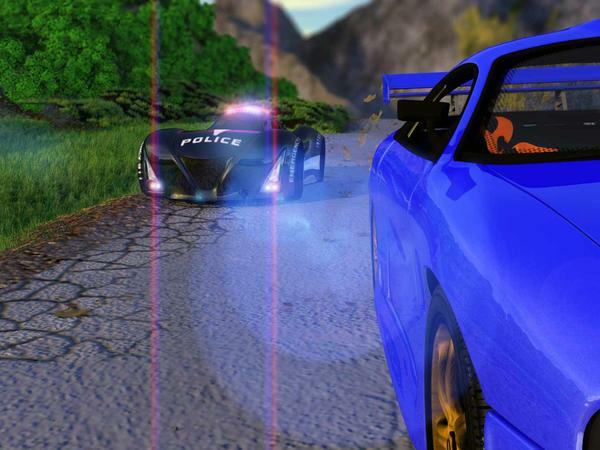 Instead of the lens flares, which may be good for some of the lights, try the 3D light sphere for some of the others. Turn it to realistic and play around with the intensity and radius. Cool thread going on... I'm loving all of your work. Very freaking cool - looking Great!!! This gave me an idea to render it all out in layers, then i can really tweak it, but where do i find out how to compositr it in photoshop? ie the diffuse, spec, reflection and so on. I know that I usually enable the little checkbox wa-a-a-ay at the bottom of the screen in the Render room that says Correct Layer Blend Mode (below the Multi-Pass option). Also, if you're talking about just adjusting the lens flares in post production, all you need is the Post Effect render pass. Curiosity has me wondering when I render it all out seperately, how do you composite it, i don't really find any topics or help on this. Right. I guess we don't really have much on that here - we should. I was just talking to evilproducer the other day, I just learned how to make an Occlusion Sandwich from the Digital Lighting & Rendering book, which has a very precise method. Background layer is the Fill Pass, the brighter one with no shadows. This has to be multiplied by the next layer, which is the occlusion pass. Add, screen, any other layer method is incorrect. The final layer, the Key pass, with the dominant lights and real shadows, must be added to the result. So there are different methods. I am one whom has always just shot out a single pass of animation, and I'm about to start experimenting, as my own self-inflicted homework, with the Occlusion Sandwich workflow to see how I like working like that. But what about other methods? Certainly there are some here that use multi-pass to good effect... one of us should really get a new thread going on that topic. Here an evolution of my WIP. There are 4 terrains, 1 for the principal scene which I duplicated to give a texture to the path (see screenshot). There are also three other terrains for the background. All the trees were placed with the surface replicator but those of the principal ground were transformed into real instances to place them more precisely. The joggers (and the fisherman) are M4 whose total size was reduced to 20% (5x) to correspond with the ground scale. I plan to convert trees for those which are not placed at the vertical. @Kashyyk - the detail of the road (cracks in the pavement) is superb. @Stezza - am I right that you are using the morphing dog? I couldn't get it to work in Carrara for the longest time because I was loading the morphs on to the wrong resolution model. Fun approach. @Dudu - Nice touch to have the bird on the pond. I zoomed in and the reflection is perfect. @EP - wicked tree trunk. 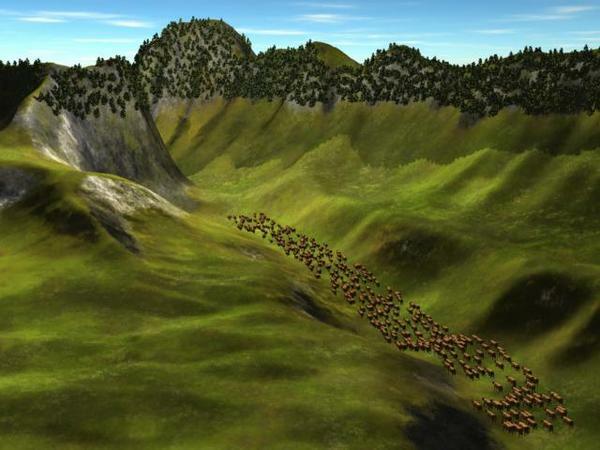 I used a replicator to add MMoir's grass pack to the valley and the plateau. I scaled the grass up to try to make it more like meadow clumps. I might put a cowboy on a ridge looking down at the cows, so I threw in the millenium horse. I made some progress in adding additional layers to the terrain shader. I wanted the ravine where the cows are to have more green than the other "grass" areas. But the overall look still feels fake to me. I am going to have to re-read this tutorial from C4 days. works fine for me.. were you trying to apply the morphs onto the LEDog? maybe that is where the problem lies. I don't know the "right" way for a lot of the Photoshop stuff. Many times I just experiment with the settings until I get something I like. I make note of what works for me and then I use that method in the future for similar effects. The truly liberating thing for me in PS, was learning how to properly use Layer Masks. 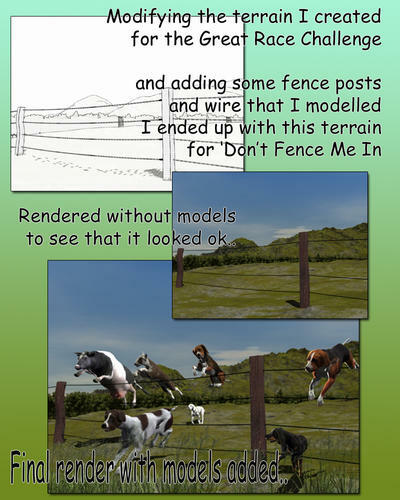 For the light effects you were mentioning, you wouldn't need to use that, but for DOF you would. In Photoshop, the fill layer is on the bottom of the sandwich and is set to normal, the Occlusion render is in the middle and set to Multiply, and the key light render is on top and set to Linear Dodge or Add in other software such as Gimp. I'm quite curious to try this method in an animation as Final Cut Pro supports layers and has those layer blending options. If you look at what DUDU did with his road, you could use the same method to create a different texture for the bottom of the valley. You could either use 3D paint and paint a black and white or gray scale map to use as a distribution map in Carrara, or you could export the height map from the terrain editor and use that as a guide to paint the distribution map in an image editor. Using both methods, you can have very fine transitions or softer edges and gradual transitions. Once you have the distribution map, go into your terrain shader, and pres the little plus sign at the bottom. The only choice will be Terrain. Select it and you'll have two sub categories. The first one is terrain distribution functions. To use a distribution map, in the second choice select texture map, load the distribution map you painted, then copy that and paste it into the Distribution position. 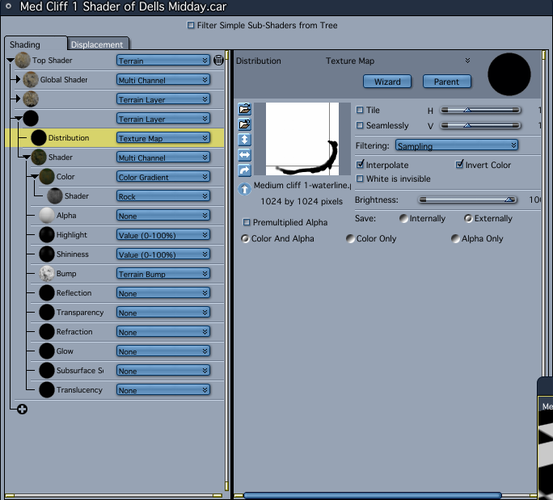 Now, the second spot can be changed to your preferred shader method. I usually change it to Multi-channel so I can have more options. Thanks EP. 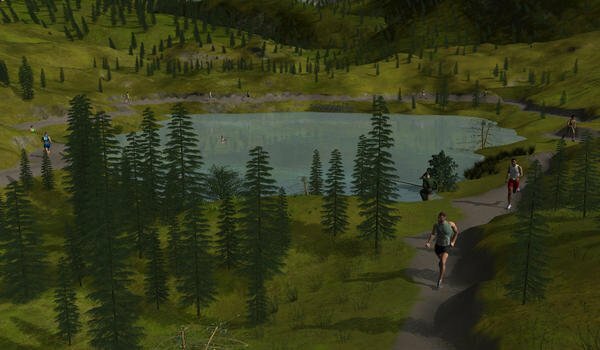 For this, I prefer to use the terrain shader rather than the 3D paint tool to create custom terrain regions and to use them to control the replicator distribution. I still need a lot of practice making the shader itself look good. 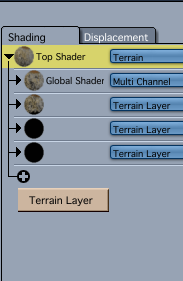 Here is what I did to create the custom terrain shader regions. I wanted an extra shader for the ravine valley bottom and one for the plateau between the ravine and the mountains. I have circled them in the attached pic. There is a richer green gradient with a noise function making the valley floor (circled) look a little brighter than the other greens on the terrain. There is a paler green gradient with a noise function making the plateau (also circled) a little paler. To create the regions, I opened the default terrain shader and added a custom region by clicking the plus button. I chose custom, which opened the environment panel. To isolate the ravine valley floor, I used the elevation function with settings from negative to a low level. To illustrate the result, see the yellow region in the attached pic. It corresponds to the brighter green gradient mentioned above. 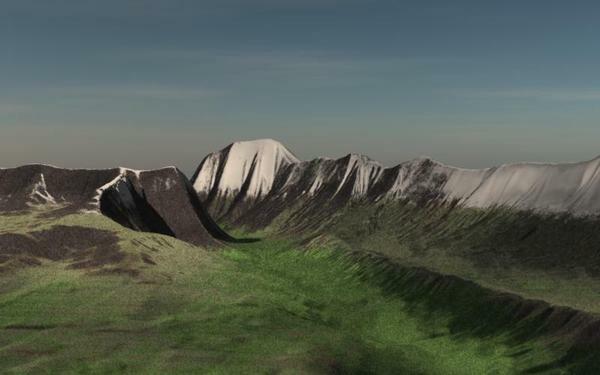 I used a combination of elevation range and slope range to isolate the plateau between the ravine and the far mountains. See the red region. 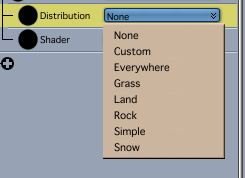 Once these regions are created in the shader tree, they can also be used to control the replicator distribution. That is how I placed Mmoir's grass and the cows. 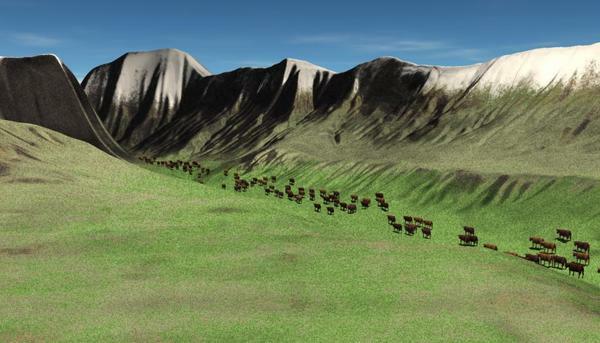 I have also used the 3D paint tool to create a narrower marching line for the cows replicator distribution, but at the moment I am using the terrain shader so that the cows have spread where the grass is greener. Sure, the elevation function and other distribution functions are great too and I also use them heavily. I actually use a lot of different functions together. The larger image you posted a few post above looks as if the elevation shader needs to have a bit of wiggle to it or more blending as the edges are very neat and well defined, which adds to the artificial look. 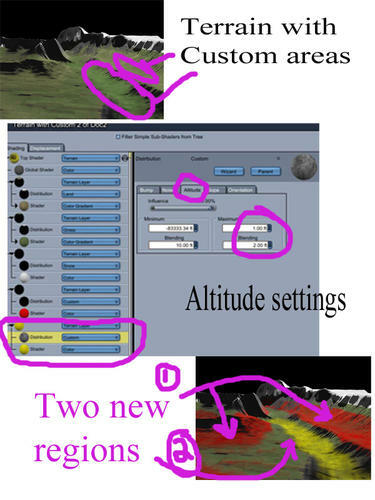 Also, don't forget that you can use the other distrubution functions besides elevation, as many of the terrain distribution shaders use slope and elevation to define the distribution. They also have noise functions you may want to play around with, such as scaling and stuff. Not to mention operators like Add, Subtract, Multiply, and Divide, for example. Shader nesting can become quite addicting, true. But the results can be amazing! Then you can move stuff around by hand! Not sure if that breaks rules for this though... too many rules to read throws off my creative juices - perhaps I am a victim of ADHD or some such disorder. Very grateful to EP and to Dart for some helpful tips. Also, that C4 tutorial had some very good tips. For the moment, I am just concentrating on the shader for the underlying terrain for the moment, not the replicated plants or herd. 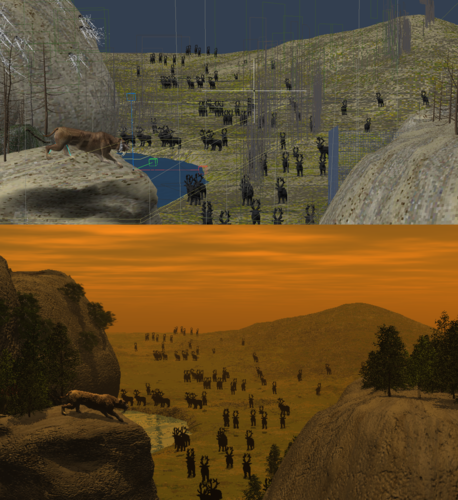 The biggest differences are (1) increased contrast in the fractal noise functions for the color gradients, (2) increased blend and noise in most of the environmental channels that would allow it, and (3) reduced color in the color gradients (moving the choices closer to gray on the color picker triangle). I think the attached is greatly improved, even though there is more work to be done. Happy St Patrick's Day. It is an unexpected snow day where I am, so I can play with Carrara a little bit this morning. After a great deal of frustration, I have discovered that I must pass any replicator distribution maps through Paint. Don't know why. Anyway, here is a WIP with some Noggins cows and a realistic sky. No plants this time. Lots to do but I made my own terrain and cliffs, using Dart's shader he helped me with for limestone and his trees and some other vegetation. 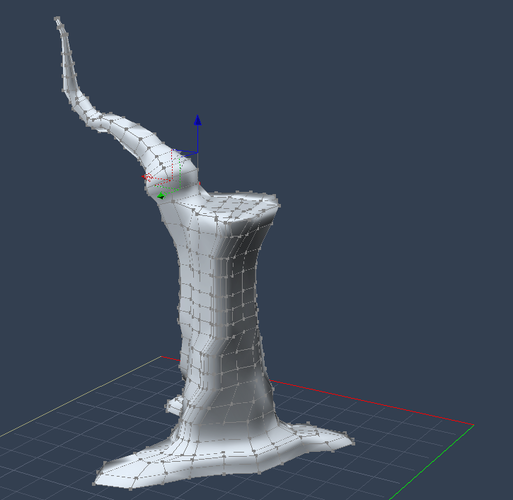 Have to rig and texture my caribou. And yes that's a millenium sabre toothed cat.